I've had this since about December 5 in my Samsung Galaxy S4 and it has worked flawlessly with no issues. Dead in just over a month. What can I say. I did just after the 30 days NCIX warranty. How awesome. 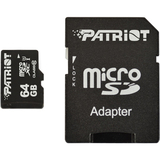 The included microsd adapter is extremely cheap. It gets super hot when tansfering files. Maybe it toasted the card. Who knows. Over all, I am very disappointed.Don't know the order ID. Other wise I'd give it a 1 star. Cons: Died within 60 days of use. Pros: Fast with large capacity. This card worked very well on my Galaxy S4 until is started disconnecting after about 7 weeks of use. When it completely stopped responding, I thought the issue might be with my phone at first. I tried the card with two separate card readers and an Android tablet to no avail. Totally dead and is not even recognized by any device. Probably just bad luck on acquiring a lemon item. Patriot usually has very good products. I purchased this card for a galaxy s4 phone. read speed at around 22MBps, which is fast enough for all the music and video I stored on there. It is a nice and cheap way to add a lot of storage to your phone/tablet. The Patriot Flash Card allows you to save and access data easily and conveniently. It provides you with a massive storage space of 64GB allowing you to store high resolution pictures and high definition videos. Its class 10 specification ensures consistent performance and fast recording of videos in full high definition. This memory card is compatible with mid range cameras and camcorders. Order the Patriot Flash Card right away!